This is small, underglaze blue and white cobalt decorated Chinese export porcelain dishes, intended mainly to the South East Asian market, often referred to as Kitchen Qing and sometimes "nonya blue and white porcelain", however this might not be agreed upon by everybody. The decoration mainly consists of what is probably a stamped or printed stylized chrysanthemum. 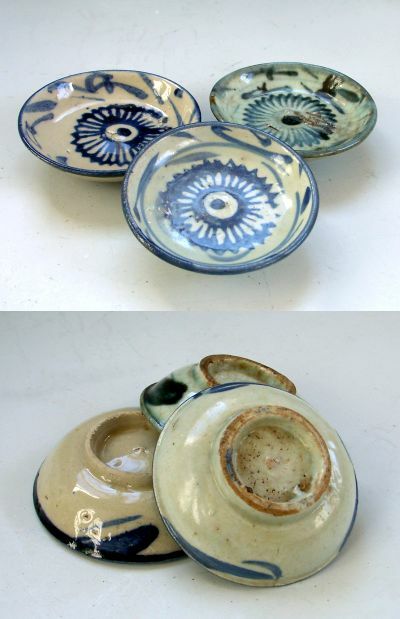 This kind of porcelain are often found in Malacca and Singapore, and similar dishes are still used for serving chili together with most dishes. These dishes date to the Qing dynasty, early to mid 19th century. A guess is that two of the dishes might be from the Fujian province, and the remaining one (top right above) is of a Jingdezhen type Chinese porcelain, with some crackles and an incised owner's name character engraved in the glaze. One of the reasons why so many Chinese left their homeland, was to find work following the many disaster that struck China by the mid 19th century. Some went to find work in the sugar cane fields on Java, some went to the coal and tin mines on Malacca, or later, to the rubber plantations. One distinct possibility is thus that the incised signatures - who are quite common on these kinds of household porcelains - are actually the signatures of Malaccan food stalls or "hawkers". The common assumption otherwise is that they are the personal name or signature of the owner to help the porcelain finding its way home after having been lent out. Some of these utilitarian bowls, similar in style and age, to these small typical "Chili dishes" are still called "tin miner's bowls". Large drama in a small pieces.